Wow! The National Insurance Company has uploaded the list of those candidates who have been shortlisted for the AO Mains Examination which said to happen on 2nd July 2017. The List needs to be checked by the students cautiously so not to miss any crucial information given in it. We have the information about the phase 1 and phase 2 exams for the post of Administrative Officer (AO) and the NICL AO Mains Admit Card 2017 as well. So, what are the details that you will be required to have in order to download Hall Ticket or check out NICL AO Mains Exam Date 2017 for the Online Exam? We, on this page, are going to tell you about it in detail. But, before we do that, let’s give you some idea of what the company is all about. You will be going through a very informative guide and this is going to be very useful for you. National Insurance Company Limited (NICL) is an insurance company in India. It came into existence in 1906 and is headquartered in West Bengal, Kolkata. The skilled personnel (employees) working in this company are approximately 16000. This company was nationalised in 1972. Not only is this a leading company in India but also in Nepal. It is having a network of nearly 2000 offices. The NICL invited those who were willing to work in it by spreading an advertisement for 205 vacant posts of Administrative Officer (AO) in recent times. On 3rd and 4th June 2017, it will conduct an online exam and release the Hall Ticket for those who want to take this exam. Bringing the exam hall ticket at the time of exam commencement is compulsory and if you don’t do so, you will be disqualified from the test. So, remember to take your Hall Ticket with you on the NICL AO Exam Date 2017. There are lots of details you will find in this Administrative Officer Mains Hall Ticket. There is no entry if this important document is not found with you. You will be facing so much trouble by not carrying this entry/permission letter along with you. Moreover, you should keep silence in the exam hall or you will be debarred from the examination if the department catches you doing some unnecessary activity in the online test premises. What is highly recommended before you decided to appear for this Administrative Officer Online Exam is that you need to make sure if you are very well aware of the Exam Pattern to know the total marks it carries and the time you will be given to complete the exam without worrying about losing the marks. In that, you will also get to know the type of exam. You may consider the step-by-step procedure on this page as well. There is only one way of downloading this NICL Administrative Officer Mains Call Letter and it is by using the direct link that we furnished to the bottom side of this page. If you see any kind of error while you try to download your Call Letter, we suggest you leave that using the comment panel. At first, you have to log on to the authorised web link of the company i.e. www.nationalinsuranceindia.nic.co.in. After you visit there, you have to check out latest announcements and click on the admit card link. Provide with your registered information and submit to proceed. Wait for some seconds and get the link to download. 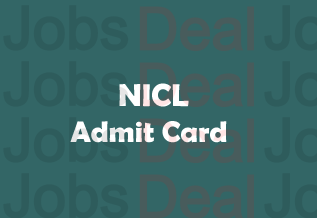 After downloading your NICL AO Mains Admit Card 2017, the very next thing would be saving it so that you can utilise it later. If due to some technical problem, you are unable to download this Call Letter, we welcome you to share your problem with us and we will guide you through the downloading process. Use the direct link to get your Hall Ticket online. We'd like you to invite your friends to take a look at this latst news for which you'd have to share this article with them!